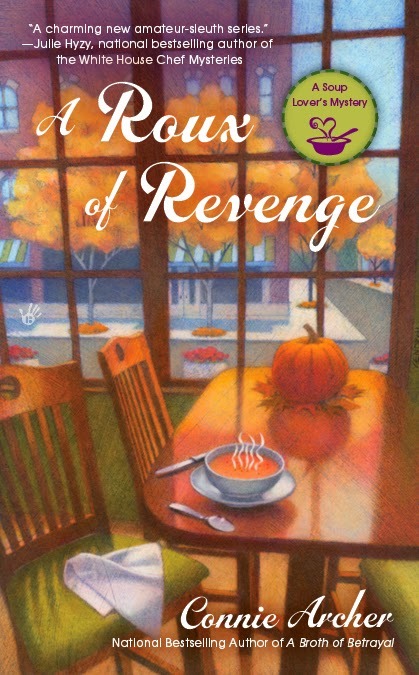 Today we have an interview with Connie Archer, the author of the new book, A Roux of Revenge, A Soup Lovers Mystery. Don't forget to leave a comment below to win a copy of the book and a little something extra from Connie. It’s Halloween and Lucky Jamieson, the owner of the By the Spoonful Soup Shop, is looking forward to the holiday. The Spoonful’s talented chef, Sage DuBois, has created delicious new recipes in line with the season and Lucky’s grandfather Jack is organizing a pumpkin carving contest. But an old crime is about to cast a long shadow over the village. Nate Edgerton, Snowflake’s Chief of Police, is called to the scene of a wreck where he discovers a dead man. His instincts tell him this was no accident – he has a murder on his hands. A retired insurance investigator offers his services to Nate -- he’s convinced the dead man may be the criminal he’s been seeking for years. Before All Hallows’ Eve is over, long kept secrets will be revealed, lost loves will be found and the lives of many in the village will be irrevocably altered. I fell in love with The Borrowers series. These were first published in the early 50’s in the U.K. and are still available today. I loved the idea of the secret family of little people under the kitchen floorboards who furnished their living space with misplaced tiny articles like wooden thread spools and buttons. But I guess my most favorite were the Nancy Drew books. A foreshadowing of what a mystery buff I’d turn out to be! My mother had found a collection of the old hardbound books from the ‘30’s and I absolutely loved them. Nancy had lots of adventures, she didn’t have to go to school, she never had homework, and she never appeared to work – at least at anything other than solving mysteries. From those books, I went on to Trixie Belden, Sherlock Holmes and Agatha Christie -- you name it – any mystery I could get my hands on. Ah . . . let’s see. I think it would be Nathaniel Hawthorne. He is one of the very rare male writers who have managed to create an intriguing female character. Hawthorne, in The Scarlet Letter, was writing in the 1800’s about the 1600’s. The Scarlet Letter is an exploration of sin, guilt, repression and hypocrisy, but it is also an amazing work of feminist literature – a woman who refuses to be crushed by society’s judgment. An interesting note about Hawthorne is that he was the great-grandson of John Hawthorne, an unrepentant judge of the Salem Witch Trials of 1692 and 1693. Nathaniel, shamed by the acts of his ancestor, added a ‘W’ and changed his name to Hawthorne. Do you ever have doubts when you are in the middle of the writing process? How do you get past them? All the time! There are some rare moments when a bit of a roll happens and I realize I’ve just written 1,000 words. That’s a good feeling! Even though I know I’ll probably end up deleting half of it. Writing a book can feel like swimming across a river when you can’t see the other shore and the current is against you. It’s very hard to trust that somehow it will all come together and make sense and turn into something that other people will actually enjoy! I’m sure my experience is the same as other writers. There’s no way to get rid of doubt. You have to accept it and trust in the unknown. And maybe being in a state of raging doubt and insecurity is a good place to be, because you won’t get lazy and start thinking that what you’ve written is brilliant. It’s probably not! The publisher had asked for complete outlines of each book and allowed two months to submit the outline. After that, I had only six months to submit the final manuscript. The outline process was a great way to approach the work. Even though no actual writing took place, the structure was in place and that made the writing so much easier. I’ve found that having a clear, detailed outline really saves a lot of time in the long run. After the outline was completed, I think I had a first draft (needing tons more revisions) done in three months. That left me one month to get the book in better shape, another month to send it to trusted readers for their comments, and a final month to go over everything again. 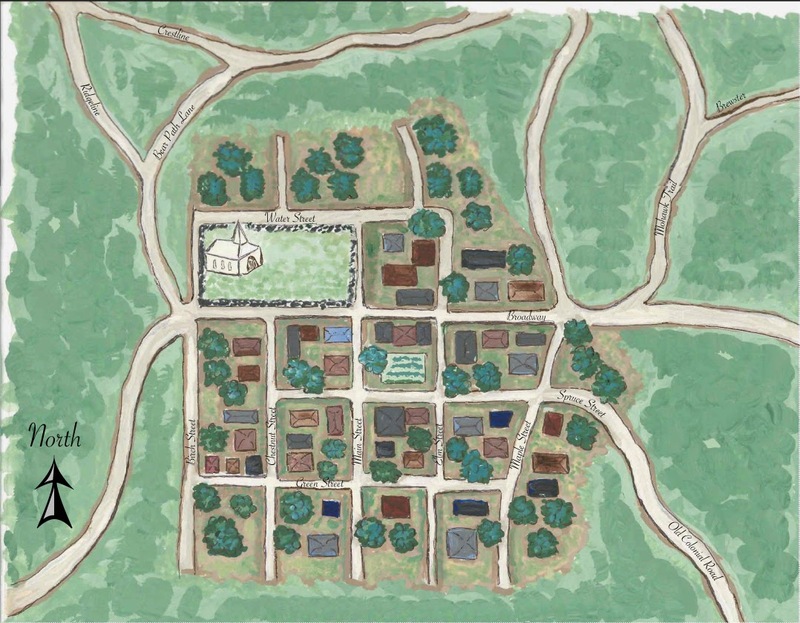 In A Roux of Revenge, a group of Scottish Gaelic speaking travelers arrives in the village. The main reason my group of travelers return there every few years is their belief that a megalithic structure outside of town called the “Stones” was built by their long distant ancestors. The Stones play an important role in this book, but that’s all I can say for now because otherwise it would be a spoiler. I did a certain amount of research on travelers or gypsies in North America which was quite interesting. 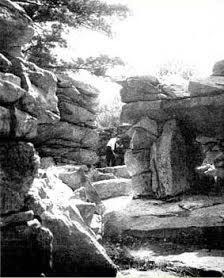 I also researched the New England megaliths and the various theories about them. They are incredibly amazing. 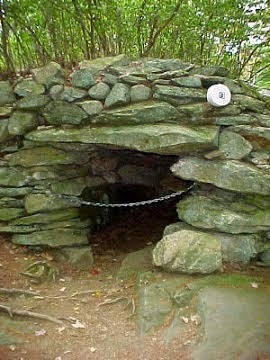 There are approximately 800 such sites (structures and markings) in New England alone – the Mystery Hill complex in Salem, New Hampshire, the Gungywamp site in Groton, Connecticut and the Calendar I and II sites in Vermont – to name just a few. Historically, these sites have been completely ignored. So-called experts have dismissed the idea that they are truly prehistoric sites, claiming they were constructed by Native Americans or were possibly colonial root cellars. For one thing, Native American tribes did not construct dwellings of stone and early colonists to New England were baffled by the strange structures and markings. Students of prehistory were sent to Europe to visit prehistoric sites, while the structures and markings we have here, all over the U.S., were completely ignored. That is, until a Harvard professor, Dr. Barry Fell, published his book, America, B.C. After that, the genie was out of the bottle. Many of these sites have been discovered to perfectly align with solstices and equinoxes as they would have appeared thousands of years ago. Academics can be very stuffy indeed and hate to be wrong, so I’m quite sure the subject is still hotly debated. Unfortunately, a lot of these sites are on private property, making it difficult to visit them. On the other hand, it may be a blessing, since their locations on private property have helped to preserve them. The Stones just outside of Snowflake are a figment of my imagination but I really enjoyed adding a bit of made-up history and creepy mystery elements to A Roux of Revenge. Connie Archer was born and grew up in New England, ice skating on neighborhood ponds, clamming on the beach at Cape Cod and skiing in Vermont. As a schoolgirl, she spent several years wading through Caesar’s Gallic War journals and the twelve books of the Aeneid. During her summers she performed in a children’s theater troupe that traveled the suburbs of Boston, mounting productions in parks and children’s hospitals. Love this series and can hardly wait for this book. Thanks for stopping by! I hope you love your next visit to Snowflake. Some interesting strangers come to town! Best of luck! This book sounds fabulous and I need to read it. Hi Kim - Roux is the third in the soup lover's series. Hope you get to visit Snowflake soon! Thank you Connie for a great interview! So happy to feature A Roux of Revenge. PS - I loved the Borrowers as a kid too. Thanks to you, Deborah! I wanted to shrink myself and live with the Borrowers! A soupçon of mystery. Oh boy, sounds like good reading. Hi Barbara - lots of recipes too! Thanks for stopping by! Thank you! Best of luck and I hope you get to visit Snowflake very soon! So glad you could stop by! And good luck as well! This book sounds great. Being from the left coast, I had no idea there were ancient stone structures in New England. I love a mystery where I can learn something. Isn't it amazing that these places aren't well known? Of course some of them are on private property so it's very difficult to see them, but I believe there's a huge site in Ontario, Canada that's accessible and protected by the Canadian government. So glad you could stop by today, Malena! Hi Deborah - Thanks so much for this chance to talk about A Roux of Revenge and share a little of my research with your readers. Wishing everyone the best of luck in the giveaway and hoping their journey to Snowflake, VT is a memorable one! Chiming in late here, but I'm really looking forward to reading A Roux of Revenge--and finding out about the "Stones"! Hi Linda ~ The "Stones" are fascinating. At least the real New England ones! would love to see the ancient sights. thanks for the interesting book. Hi Rhonda ~ Glad you could stop by. These sites are so awesome. The "Stones" in Snowflake are imaginary, but there are plenty of real ones all over the U.S. Best of luck! I also read Sherlock Holmes, Agatha Christie, Trixie Belden, and Nancy Drew. I'm sure the stone structure will make the book different and interesting. Hi Michelle ~ You're a born mystery buff, like me! This book was fun because of the travelers who come to town and the 'Stones.' They livened up the village a lot! So glad you could stop by, Rhonda ~ Hope you can enjoy a visit to Snowflake, VT soon! Thank you! I'm checking back on Mystery Playground. Sorry, I've been away on my blog tour, but wanted to thank you! I hope you enjoy all the happenings in the village in A Roux of Revenge! 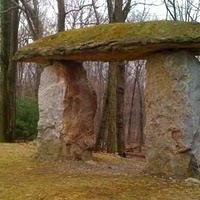 Growing up in Nashua, NH I had never heard of the American Stonehenge, until one summer when my kids were little and I took out a map and we looked for interesting things in and around our area for day trips. We went there and checked it out completely, and every time's it been featured on a TV show, think Discovery/History channels, I make it a point to watch the latest incarnation was on "America Unearthed". Isn't it amazing that these sites aren't common knowledge? I feel the same way! I wish I had known about them years and years ago. I really do think the book, America B.C., blew the lid off. These incredible structures have been ignored for way too many years. Thanks for stopping by. Sorry I missed your comment on the 5th, but I've been on a tour and didn't get back soon enough. The giveaway is now closed. Congratulations to Traveler!